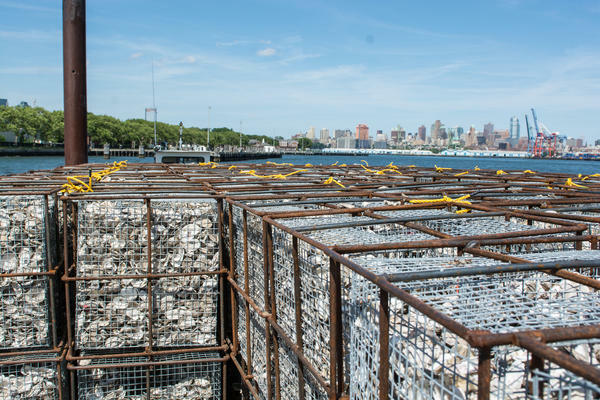 The shells are trucked over to Brooklyn's Greenpoint neighborhood and once a month are brought en masse to Governors Island in the heart of the New York Harbor. Billion Oyster Project has collected more than 1 million pounds of oyster shells so far. Oysters at Zadie's Oyster Room, one of the New York City restaurants participating in Billion Oyster Project's shell-collection program. Randall Clarke Dennis, left, an instructor at the Harbor School, watches students Timothy Morrison, middle, and Lijasad Maxwell, right, as they send 422 oyster reef structures into the Hudson River. Across New York City, more than 70 restaurants are tossing their oyster shells not into the trash or composting pile, but into the city's eroded harbor. 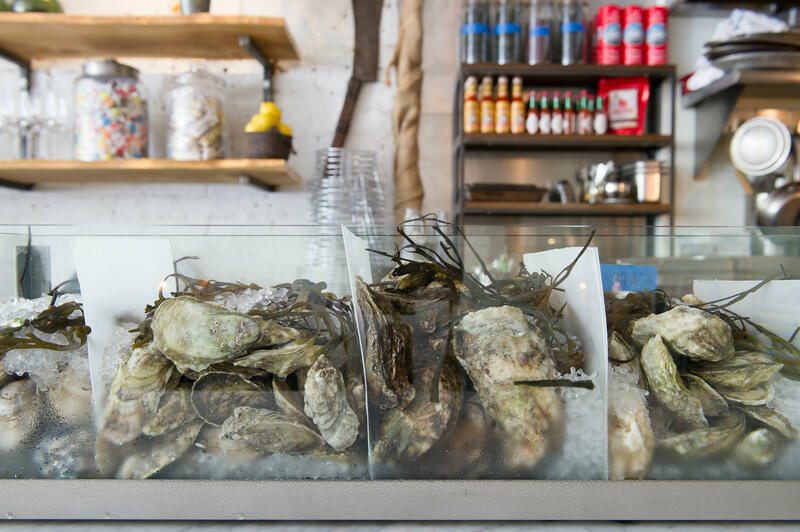 It's all part of Billion Oyster Project's restaurant shell-collection program. The journey from trash to treasure begins after an oyster half shell is turned upside down and left on an icy tray. Once discarded, it joins hundreds of thousands of other half shells collected in blue bins and picked up (free of charge) from restaurants five days a week by Billion Oyster Project's partner, The Lobster Place, a seafood supplier. The shells are trucked over to Brooklyn's Greenpoint neighborhood and once a month are brought en masse to Governors Island in the heart of the New York Harbor, just yards away from both Brooklyn and Lower Manhattan. There, rolling shell hills sparkle in the sun while "curing" out in the elements for one year, a process that rids them of contaminants. The shells then get a final cleaning and are moved to Billion Oyster Project's hatchery at the Urban Assembly New York Harbor School, a public high school on Governors Island that offers technical and vocational training in the marine sciences. In an aquaculture classroom's hatchery, student-grown oysters produce larvae in an artificially induced springtime environment. In one to two weeks, each larvae grows a "foot" — a little limb covered in a kind of natural glue — and then is moved to a tank full of the "cured" restaurant shells, which serve as anchors for all of those sticky feet. This phase is critical: If larvae can't find a place to attach, they die. One reclaimed shell can house 10 to 20 new live oysters, depending on shell size. Once the larvae have a foothold, they're now "spat" and ready to begin their metamorphoses. "It's remarkable," says Madeline Wachtel, Billion Oyster Project's director of Strategic Projects. "Using the calcium carbonate in the water, oysters build their own shells." While not all of the larvae will survive, the goal is to get at least five oysters clustered onto one restaurant shell — think flowering oyster bouquets. 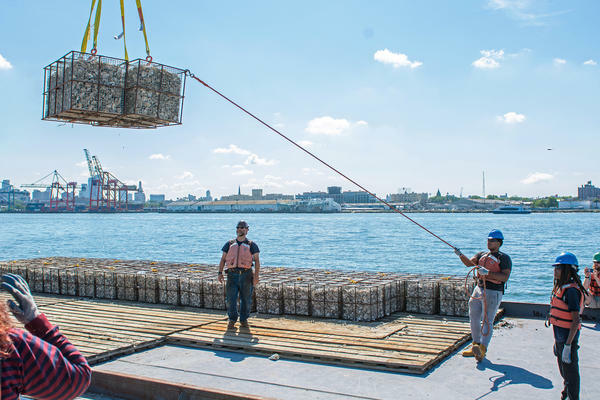 If the water is warm enough, mature oysters are moved to a reef structure — a cage or shellfish bag — that provides a stable area for oysters to fuse together and create a healthy reef in the New York Harbor. Then, the oysters begin doing what oysters do — which, it turns out, is quite a lot. Oysters are natural water filters; each one cleans 30 to 50 gallons of water a day. They also provide food and shelter for all sorts of marine creatures, supporting biodiversity. "Oyster reefs provide great marine habitat, similar to coral reefs, with nooks and crannies to protect juvenile fish, and are active food for some species. They help to create a thriving ecosystem," Wachtel says. But the biggest draw for many coastal states such as New York, especially in an era of rising sea temperatures and eviscerating hurricanes, is that oysters can provide natural breakwaters. Oyster reefs can protect against a hurricane's wave velocity, which can destroy a city's infrastructure. The New York Governor's Office of Storm Recovery has partnered with Billion Oyster Project to install oysters on its $74 million Living Breakwaters Project, which aims to reduce and reverse erosion and damage from storm waves, improve the ecosystem health of Raritan Bay and encourage environmentally conscious stewardship of nearshore waters. Billion Oyster Project Executive Director Pete Malinowski says none of this work would be possible without the restaurant shell-collection program. "It's critical. We need oyster shells to do our work, and the only place to get them is from restaurants," Malinowski says. Luckily, restaurants are more than happy to oblige; Billion Oyster Project has collected more than 1 million pounds of oyster shells, well on the way to its goal of creating 1 billion live oysters — hence its name — across 100 acres of reefs by 2035. Brian Owens, who goes through about 20,000 oysters a week at his restaurant, Crave Fishbar, estimates that he has donated about 20 tons of oyster shells since he teamed up with Billion Oyster Project three years ago. "We want to minimize our waste and increase our impact on the community," he says. "Working with Billion Oyster Project is an obvious fit." Owens says the project is not just smart for sustainability; it's also good for business. Recycling shells significantly reduces carting expenses, something all NYC restaurants must pay for by the bag. "Recycling them into the reef is a huge savings," he says. In addition to saving on garbage collection, restaurants may soon be eligible for a tax credit thanks to New York Assemblywoman Linda Rosenthal. The credit is a much needed balm for restaurants that have been hit with escalating costs and increasing regulatory burdens over the past few years. Rosenthal hopes to be able to get the bill passed within a year. "It conforms with the state's interest in shoreline protection and shellfish reintroduction, it helps the local restaurant community and involves kids, so I am optimistic," she says. The idea came from neither restaurants nor Rosenthal, but from students at one of Billion Oyster Project's partner schools, West End Secondary on the Upper West Side. Rosenthal championed their idea, building support for the bill and bringing the students to Albany to learn about lawmaking and to participate in a press conference. Education of the next generation of environmental stewards has been at the heart of Billion Oyster Project since its inception in 2008, when Malinowski was teaching aquaculture at the Harbor School. With the support of the school's founder, Murray Fisher, Malinowski devised a project to enable students to apply their learned skills to a problem in their own back yard — the degradation of the New York Harbor. In 2010, when the school moved from Brooklyn to Governors Island, Malinowski grew his curriculum into a formal three-year vocational program in which students grow oysters; design, build and monitor reefs; and operate boats and perform marine biology research. "It became a way for all of our students to work together," he says. Fifteen years later (their #HarborUp anniversary benefit is Oct. 11), that classroom program has grown into Billion Oyster Project and now includes programming in more than 80 middle and high schools. That works out to about 1,215 high school students and more than 6,500 middle school students. Billion Oyster Project staff train teachers and set schools up with oyster research stations — an 8 x 8 x 18-inch home for oysters in the New York Harbor where students care for the oysters and monitor them for water quality and biodiversity. So far, the project has resulted in planting 28 million oysters in nine oyster reefs, including four community reefs where New Yorkers can volunteer. The health of the harbor also has improved. "We can measure an improvement in water quality and see an immediate impact on biodiversity everywhere we put a reef down," Malinowski says. While the long-term vitality of the harbor is a top priority for Billion Oyster Project, Malinowski says he is most proud of the work they do with the kids. "On any given school day there are several middle school classes at the water's edge, measuring oysters and conducting research," he says. "Through this work, students develop awareness and affinity for the resource and the confidence that comes from knowing their actions can make a difference. With young people who care, the harbor has a real fighting chance." Andrea Strong has been writing about food for the past 20 years for publications such as Eater, The New York Times, Serious Eats and Saveur. She loves oysters and hopes you will eat more of them after reading this story. Read more about her at www.andreastrong.com, or follow her on Twitter: @strongbuzz. Beaches in Broward County still don't look like what they did before Hurricane Irma washed sand away. The U.S. Army Corps of Engineers has two beach renourishment projects planned in the county to fully fund fixing the damage from Irma. The first project will tackle adding dry sand back to Southern Broward County beaches, including Dania, Hollywood, Hallandale beaches. 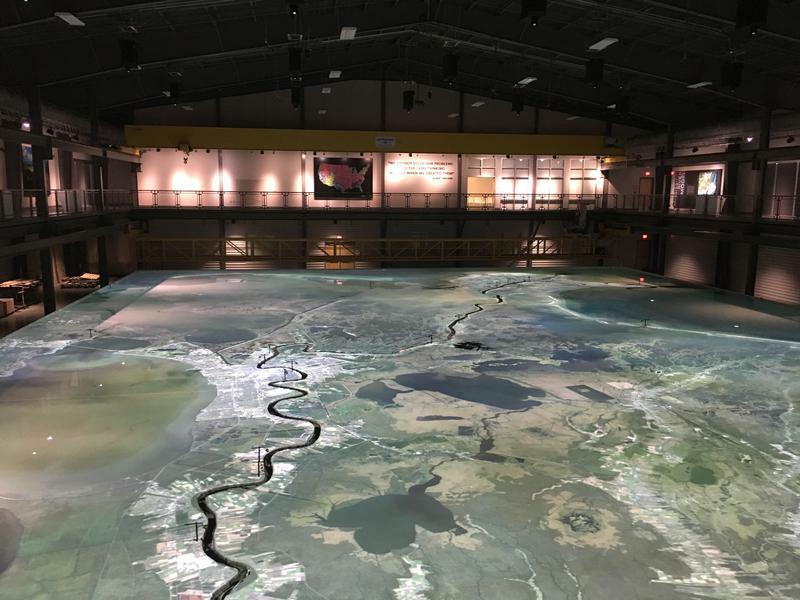 Over the past century, Louisiana has lost more than 2,000 square miles of coastline, leaving it more vulnerable to storms, flooding and sea level rise. State officials have been fighting back, building levees, artificial marshes and barrier islands. Now they want to harness the muddy Mississippi River, diverting its sediment-rich waters into shrinking marshes and wetlands. 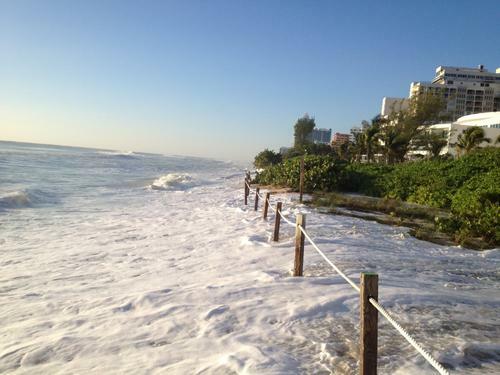 Miami-Dade County needs new sources of sand for its beaches. 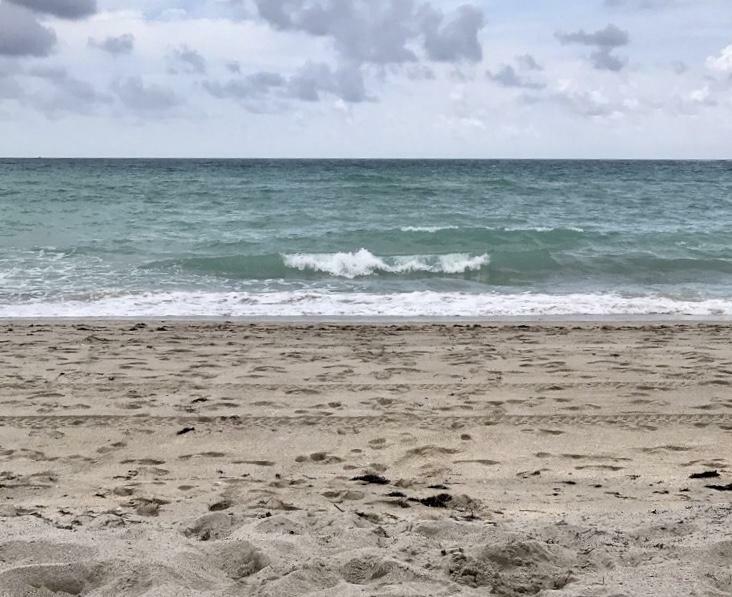 The Army Corps of Engineers says Miami-Dade is running out of offshore supplies and the county is looking for new places to harvest sand. The corps is holding public meetings every day this week starting in Miami Beach this evening. Meetings will be held in Palm Beach and Broward counties Tuesday and Thursday. The corps is already considering a couple of different places Miami-Dade can get more sand from such as upland sources and federal and state waters in Southeast Florida.